Priceless possessions left to decay in neglected forts. 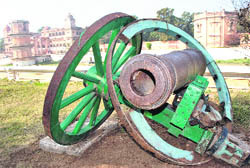 An old canon with damaged wheels, which was once a prized asset of the Patiala royal family, lies in ruins. 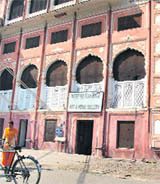 Priceless belongings related to the Sikh history have been decaying in the historic buildings located in Patiala, courtesy the state government's laxity in putting them on display for tourists and historians. 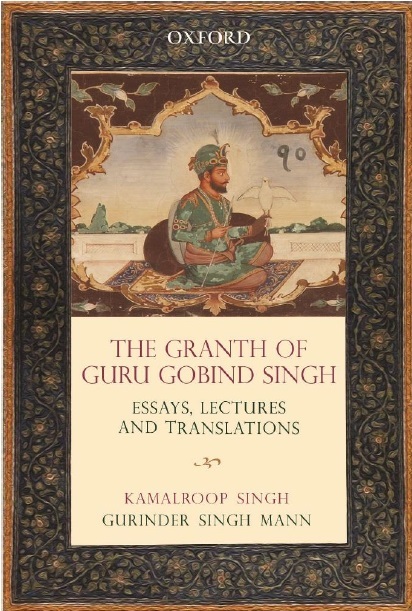 Among these goods are the personal belongings of the tenth Sikh Guru Gobind Singh and a collection of over 3,000 medals collected by the erstwhile rulers of Patiala. Away from public glare, these are decaying in caskets. Guru Gobind Singh's relics have been kept in a dingy room inside Qila Mubarak, which is already on the verge of collapse. These include a cloak given to Baba Triloka; manuscript (Bani), handwritten script of the guru; comb with hair and turban given to Syed Pir Budhu Shah of Sadhaura after the Battle of Bhangani in appreciation of his loyal services and three swords with inscriptions in Punjabi. The medals (see box) have been kept in a museum inside Patiala's Sheesh Mahal. These are inaccessible to tourists for the past several years for reasons best known to the authorities concerned. The museum also has a rare collection of chandeliers, which lie defunct, weaponry and photography. Delay in release of funds and political unwillingness are said to be the main reasons behind the neglect. 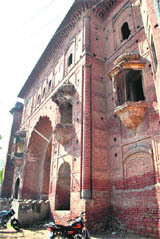 Built in 1845, the Sheesh Mahal itself also lies in a dilapidated condition. Several walls and a wooden bridge are on the verge of collapse. A portion of the building is in the possession of the Cultural and Tourism Department. The department officials, it has been learnt, allegedly connived with each together to lock a portion the building a few years ago in the name of repair, never to open it again. Malvinder Singh, scion of Patiala's royal family, said: "The Sheesh Mahal has visuals depicting the poetry of Keshav, Surdass and Bihari, which are a treat for anybody's eyes. There are paintings that relate with the Hindu and Sikh mythology. These are timeless and the government should take steps to protect them." Harpreet Mohinder Singh Rosha, a member of NGO 'Patiala Our Pride', said: "The over 3,000 medals collected by the Maharajas of Patiala lie locked inside the medal gallery. The government must explore options to put them on display." Besides these belongings, there are other historic buildings that have been lying in a shambles. The Bahadurgarh Fort, located on the Rajpura road, is currently in the possession of Punjab Police, which trains its commandos there. The fort was the outermost point of Patiala and it is said that a tunnel connected it with Qila Mubarak (where the royal family stayed), which would facilitate their exit in case of any emergency. The fort walls as well as its interiors are in a bad shape. Royal scion Raninder Singh said, "The Punjab Government should stop selling buildings in Patiala and manage facilitate finances for the maintenance of all historical buildings." Principal Secretary (Cultural Affairs) SS Channy said, “An amount of Rs 44 crore had been earmarked for three buildings in Patiala. Of this, Rs 32 crore was for Qila Mubarak, Rs 8 crore for Sheesh Mahal and Rs 4 crore for Bahadurgarh Fort. We will start work soon after the initial project reports are submitted." Asked why the tenth Guru's belongings lied locked in a room inside Qila Muabarak, Channy said he was seeking an appointment from the Chief Minister and only then he could shift them to Virasat-E-Khalsa museum in Anandpur Sahib. On delayed work and non-release of funds for the projects in Patiala, Channy said he was new in the department and could not comment on the issue.